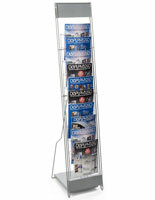 Is your business in need of a portable trade show literature rack for marketing at off-site events? 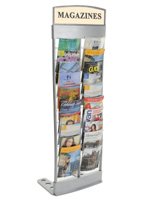 Showcase company publications such as catalogs, trifolds, and newsletters using thoughtfully designed fixtures, in a huge array of great styles, colors, and pocket configurations. 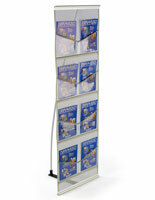 This portable trade show literature rack, also known as a knock down folding magazine display, has many uses for business. 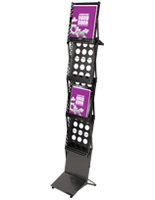 Due to their compact design, these holders for brochures take up very little floor space. 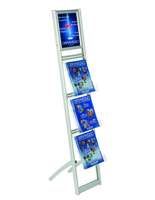 The portable trade show literature rack is a must-have sales tool for road warriors. 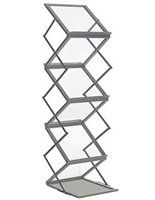 As a convention tool, these fixtures have myriad features to recommend them. 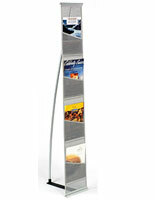 The foldable brochure showcase is lightweight and portable and easy to set up in an exhibit booth. 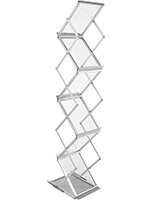 In addition, the collapsible design makes it easy to open up or fold down to put away. 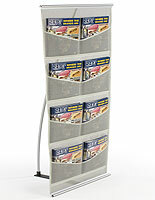 This folding magazine kiosk for an exhibition makes the perfect exhibit for an expo or sales meeting. 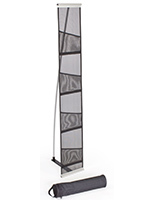 This fixing is perfect for temporary presentations like convention booths, or for permanent exhibitions in a smaller venue. 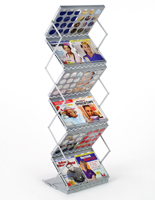 This folding magazine display saves time for busy professionals who would rather focus their time on interacting with customers and prospective clients! 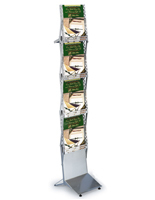 In addition to well thought-out designs, these foldable pamphlet holders are made of quality materials, and many have carrying bags for travel. 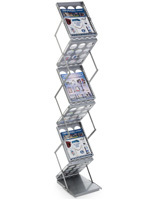 There is a lot of competition for attention at an expo, so the more visible and attractive your collapsible catalog stands are, the more likely customers will flock to read materials about your organization! 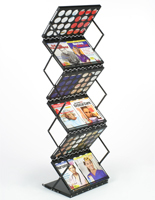 What are some of the benefits of buying a folding magazine display? 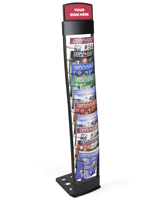 A lightweight portable trade show literature rack is easy to take on the road for expos and conferences, and easy to store in your car, or in an office closet. 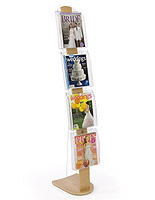 A periodical holder comes with a few pockets, or lots, to store a multitude of publication sizes in one clever stand, so it's versatile and can be used for different events. 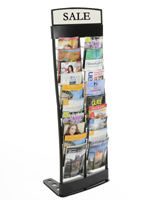 A pamphlet display with a weighted base keeps trifolds and magazine presentations stable, even when lots of visitors are expected. Carrybags protect a knock-down literature rack during transit, or when not in use -- and they blend in with other luggage. 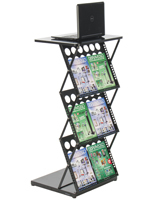 Organize brochures on these versatile racks to keep your booth neat and polished while presenting PR. 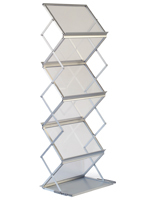 The folding units help professionals pull off important events that potentially draw in new business. 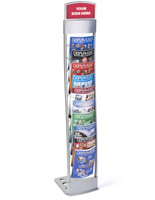 These information mounts for magazines and leaflets are affordably priced, and they are instant sales boosters. 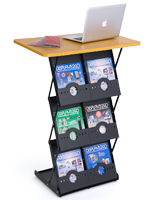 Put an end to messy piles that take up valuable space in a booth, with well-designed periodical displays that fold up into a carry bag. 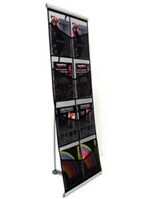 Organize important corporate or organizational descriptions with this massive array of foldable supplies. A myriad of pocket configurations, from just a few, to 10, and beyond, are offered to accommodate various types of periodicals. This site offers quick-ship, even same-day shipping for in stock accessories! 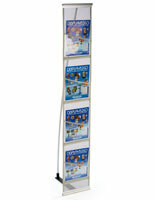 Portable trade show literature stands are available in an array of materials, weights, sizes, and pockets configurations. 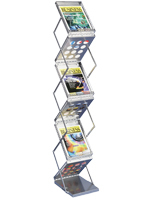 Due to their vertical presentation, these expo fixtures take up only a small footprint, which creates floor space for showcasing merchandise. 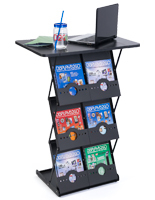 Affordable knock-down catalog holders are great for off-site meetings, conferences, large scale conventions, hotel exhibitions, and sales meetings. 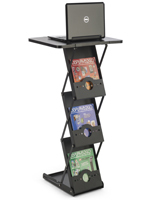 These lightweight magazine storage stands are compact, lightweight, and easy to carry. 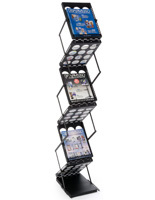 This rack for displaying collateral business publications comes in a variety of pocket configurations. 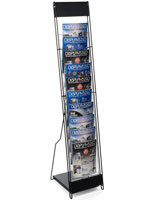 This rack that is a knock-down magazine holder is a must-have marketing tool for expos and conferences. Some models in this line of supplies come in metal and lightweight aluminum construction that will last for years. 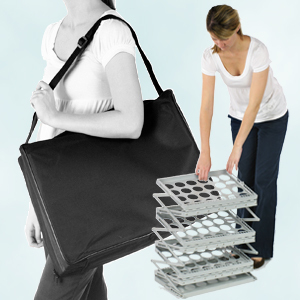 The lightweight nature of these holders makes them easy to carry on business or school trips. 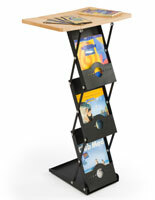 Some of these periodical displays in wood look as nice as home furnishings! This literature stand should be brought to any event where the public can be introduced to goods and services via printed materials. 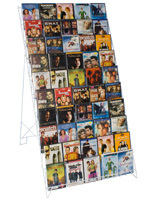 These temporary mounts are perfect also for advertising seasonal merchandise in a store, but they are strong enough to serve as a permanent display.